It's day two of seven for RAWards voting. 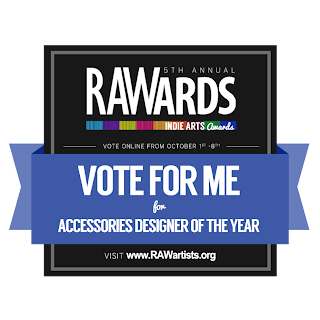 Please help me win a chance to showcase my original jewelry in the semi-finals by voting HERE.Your support means a lot to me! I know the site was slow yesterday, but it seems to be running much more smoothly today. The deadline for voting has been extended one day due to the issues they were having with the website yesterday, so you can now vote once per day through October 9th! All of my hand painted seashell jewelry features an original character that is part of my Aquatic Avenue Crew, a group of eccentric ocean dwellers and undersea neighbors. Each one-of-a-kind necklace or trinket tray comes with a description of the character it displays. You can read more about my characters by checking out the free downloadable coloring pages on this blog, click HERE. Below is an example of one of my favorite characters.